In order to successfully fish estuarine flats it is important to be always on the lookout for places where fish will likely congregate. Features such as subsurface rocks and weed beds are regularly identified as fish holding areas and need no further discussion. However, one of the most obvious fish attracting features in an estuary is one that is often overlooked completely by anglers, namely moored boats. Most harbours have a flotilla of moored boats bobbing about on fixed moorings and these all will hold fish under them at some point in the tide cycle. 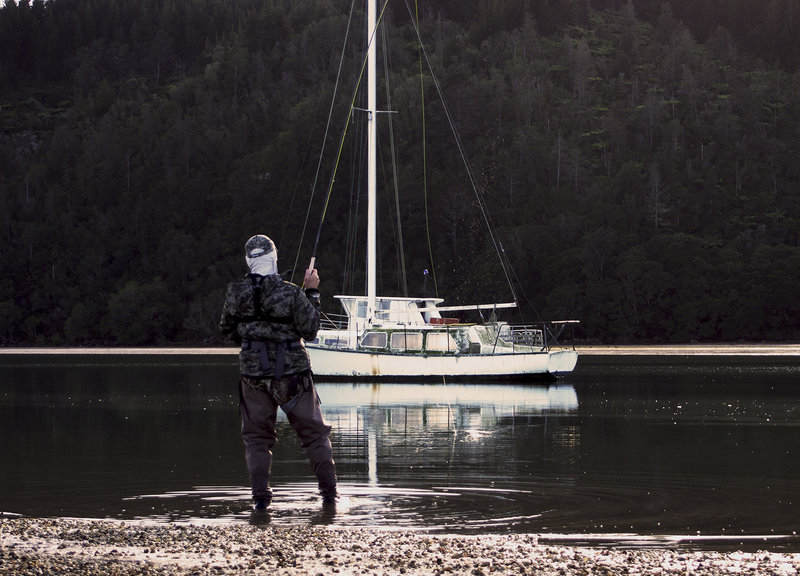 Yachts and motor launches are the main angling targets in estuaries and I select my targets based on how deep the hull protrudes below the water surface and how large a shadow the hull casts. Generally the larger the motor launch or the deeper the keel of the yacht the more water is required for safe mooring. Yachts generally are moored in the deepest part of the channel as they can need up to 3 metres of water depth to prevent the keel touching the bottom at low tide. The channel in the photograph above follows the tall yacht masts. Motor launches do not generally require as great a water depth for mooring as yachts but are not normally moored in depths less than 2 metres. Moored boats are fish attracting devices and should be a major target for fly and spin fishermen. Fish congregate under moored boats because they often have growths of weed, mussels or limpets on their hulls. In extreme cases these growths can be prolific and, when this occurs, the moored boat becomes a major point for feeding, especially at times of minimal tide flow. Small baitfish are protected from predation under a moored boat (especially from aerial predators) and by sitting close to the hull or hard on the bottom under the boat they are largely protected from tidal currents. Obviously if there is a resident baitfish congregation under a moored boat then it will also become attractive feeding area for higher predators. Predatory fish often congregate in the shaded areas cast by moored boats in summer and it is always worth retrieving lures through these shaded zones. Predators undoubtedly use shade based attack as a deliberate strategy to improve catch efficiency during the day, in much the same way that the change of light triggers heightened feeding activity. Baitfish sitting in bright sunlight have major problems identifying fast moving predators attacking them from shaded areas. The key thing about fishing under boats is to cast as close to the anchor warp or chain as possible and try to drift the lure under the hull. I aim to drop a soft plastic or fly in the area between the anchor warp and the bow when casting and then pepper the side of the hull with casts as I move steadily downstream. In reality, “the closer, the better”. It is best to cast slightly upstream, immediately throw in a mend and allow the current to arc the lure or fly under the boat on a tight line. 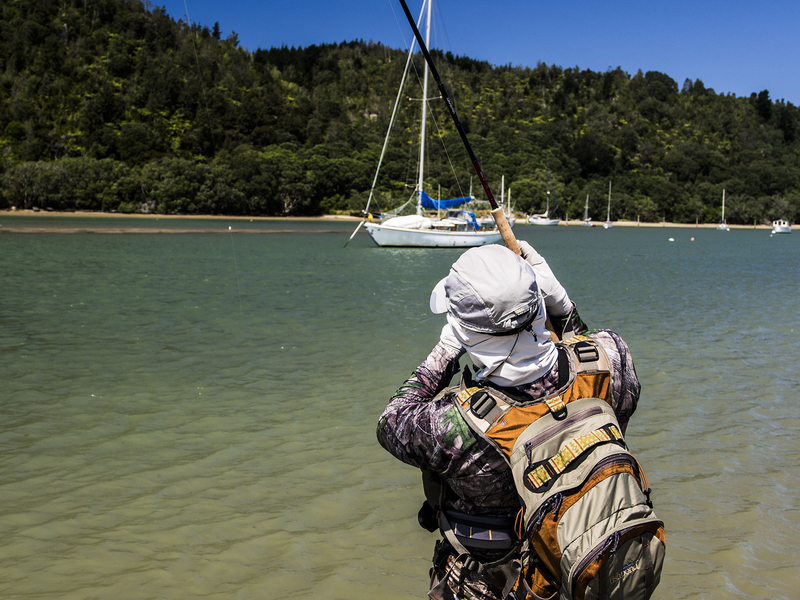 Try to vary the speed of retrieve to ensure that the lure passes under as much of the hull as possible. More often than not fish will either seize the lure on the drop as it flutters to the bottom or at the end of the arc when the line is parallel to the shore, especially if you throw in a twitch or two or a short, sharp burst at the start of the retrieve. When a fish grabs the lure it is important to immediately seize the initiative and apply side strain to make sure that the fight takes place in the clear water between the boat and the angler. Failure to do this will allow the fish to wrap the line around the anchor warp. It can be hard out, white knuckle fishing as big fish, especially kingfish, will head straight for the anchor chain. Let them get there at your peril. I’m a big fan of walking backwards away from the fish as soon as possible in the fight to keep the fish away from the boat. If you apply side and hold on tight then more often than not the fish will follow. I generally fish under the moored boats in the last 2 hours of the ebbing tide as the fish are forced off the flats and concentrated into the deeper shaded areas of the channel which, more often than not, are under the boats. Target the boats at this time of the tide cycle and you will inevitably be rewarded.